Throughout the on-going development of Teddy Tennis, we have used the most demanding of market researchers; 3, 4 and 5 year olds, to test out all our concepts. Every aspect of Teddy Tennis from the music, the pictures, the activities themselves and even the names of the bears have been scrutinized by our diligent market research team, the hundreds of children that have attended Teddy Tennis sessions at our home base in Holland Park, West London. Enrolling your child into a Teddy Tennis program, will have massive positive impact on the development of your child; in a very short space of time you will see that it was one of the best decisions you have ever made. 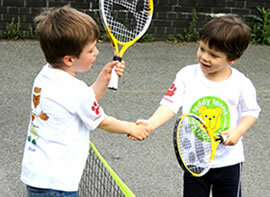 Teddy Tennis: Developing children’s skills and abilities through sport and FUN. As part of the evolution of the Teddy Tennis program, we are delighted to announce the introduction of a new area of focus for Teddy Tennis, the concept of Good Sportsmanship. Starting this summer, all Teddy Tennis coaches will be gradually introducing the concept of good sportsmanship to every Cub Cadet that plays Teddy Tennis. The long term benefits of this we think will be very positive and we hope that everyone involved in Teddy Tennis, be they a parent, a school or indeed a Cub cadet will be very pleased with this development. To find out more about Teddy Tennis and Sportsmanship and its implications, please click here to download a datasheet that will tell you more.